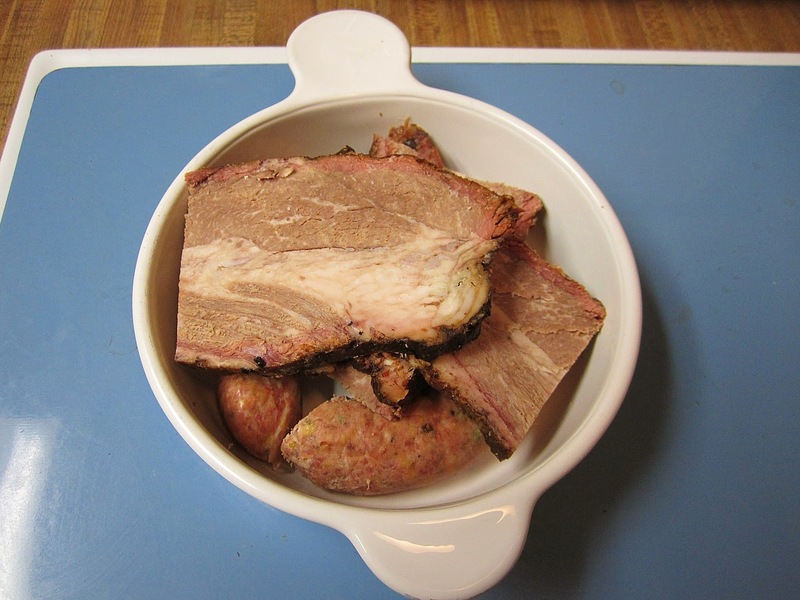 I've had several folks ask how I go about reheating frozen brisket and sausage. In the past I have answered privately, but since it has just popped up yet again (thanks Steven), I figured it deserved a post. I know there are a variety of ways folks go about this, but this is how I do it and I'm very happy with the results. First off, I never freeze pork ribs. I am too close to some really nice ones I can get fresh any weekend so I have no need to ever freeze them. However I do often freeze brisket and sausage. 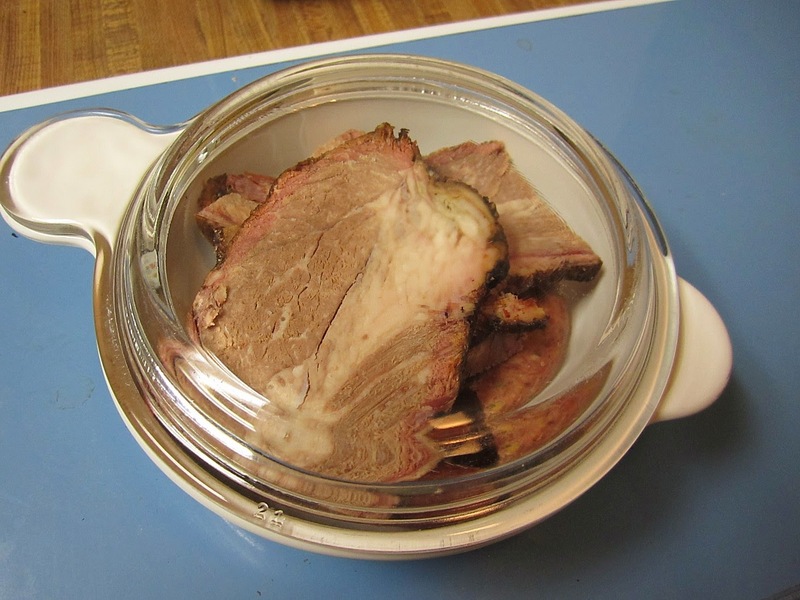 I have bought many frozen 4 pound hunks of brisket from Black's, both in person and by mail. I have also frozen lots of brisket from Pecan Lodge and Franklin BBQ, all with good results. 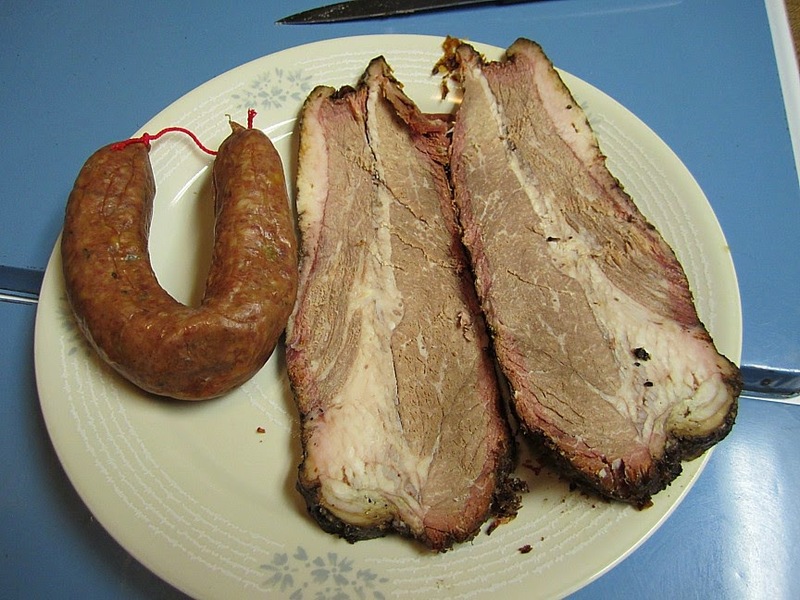 I have also done lots of jalapeno cheese sausage from Kreuz. In every case I try to get it eaten up in 4-6 months. If you can, stick with the prepackaged vacuum sealed packages. That will prevent freezer burn and give you better freezer life overall. 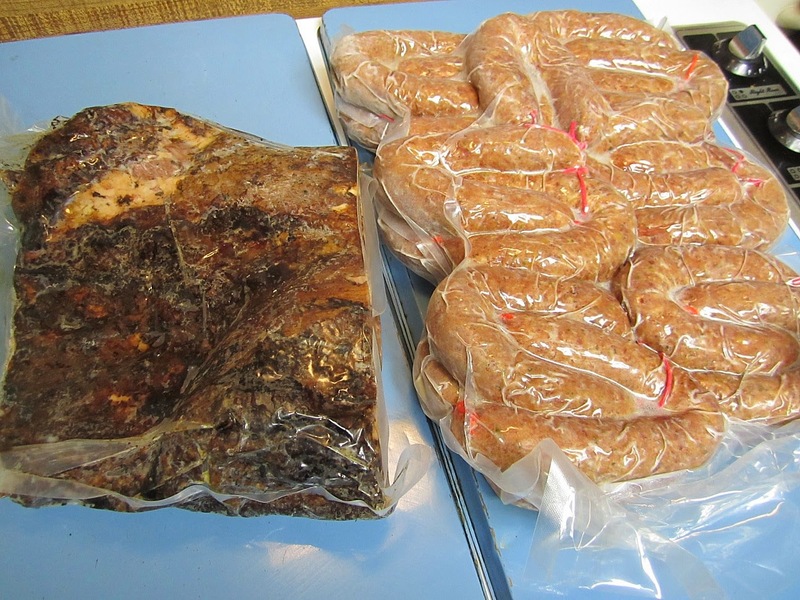 Here's a photo of 4 lbs of Black's brisket and Kreuz jalapeno cheese sausage in vacuum sealed packages. Brisket is best when you can freeze one big chunk. When you decide to thaw it out, leave it in the fridge for 2-3 days until you can feel it is thawed. Then just slice off pieces as needed and re-wrap. I think it retains the most moisture when you do not pre-slice it up before freezing. I have also sliced up brisket into quart freezer bags. This works well, too, but I think the freezer life is not quite as long and you should plan on consuming it in 2-3 months max. In the case of sausage, the first time I want to get into the big package I thaw it out just enough to break off a few sausages to thaw, then rewrap the main body and put it back in the freezer. You can also break them down into individual quart freezer bags but again, I don't think they keep quite as long. Now to the cooking. After thawing out the meat completely in the fridge, I cut it to fit in a covered microwave bowl. I use some old style Grab It bowls from CorningWare. What surprised me is they do not seem to make these anymore. You can get similar bowls with a plastic lid on Amazon, but they don't seem to have the nice glass lid anymore. I am guessing any small CorningWare or Pyrex microwave bowl will do the same and you could use any microwave plate as a cover. The two most important points are to use a covered bowl and to heat lightly. Until you get used to how the reheating sets, it is best to underestimate and have to hit it again for 30 seconds rather than overcooking it. 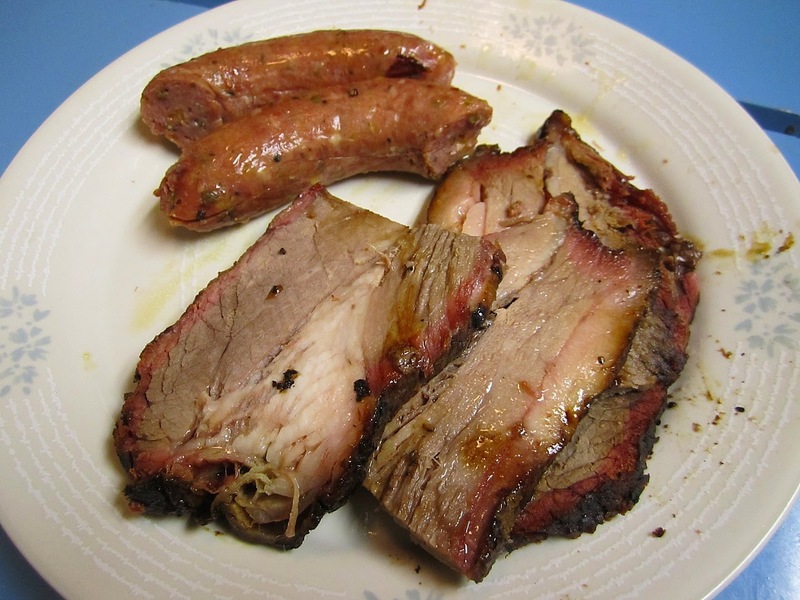 The two slices of brisket and 1 sausage above were microwaved for 2 minutes and 30 seconds. Be sure to let the meat sit, covered, for an additional 1-2 minutes after. I am always amazed to take the lid off and smell smoke from Black's, Franklin, or Pecan Lodge in my own kitchen. It will never be as good as fresh off the smoker, but you can get pretty durned close with these easy steps. The meat below was in the freezer for 5 weeks but tasted pretty good last night! Scott hipped me to this new fest in Tyler on May 3rd. They have 15 BBQ joints coming and a music fest following. There are some pretty good joints coming so we're in!